I have gotten some requests, in comments and off-the-blog, to write what I was going to say to the AGM of the PA in an appearance I was supposed to make there on Wednesday, April 28. I felt terrible about having to cancel an engagement that was booked many months ago but it was tied into a trip to the London Book Fair which was cancelled due to the Iceland volcano. Since I was really prepared for the talk, updating the “Stay Ahead of the Shift” speech from last year’s Book Expo and adding some thoughts about the immediate future in the US market that I think British publishers should take on board, the suggestion is one I can readily respond to. The premise underlying this piece (and really much of my work) is that all of us, to function, must have a view of how we think things in publishing will change. Change has been a constant in publishing forever, of course. In my lifetime, in the US, mass-market paperbacks and mall stores have risen and fallen; wholesalers have gone from local warehouses that replenish bestsellers to national operations that can provide hundreds of thousands, if not millions, of titles to any store in 24 hours; general trade publishing has consolidated from tens of real competitors to a Big Six; and, in the past 20 years or so, the superstore, usually run by a chain, with over 100,000 titles has became about the only brick-and-mortar formula that seemed sustainable. (NB: On that last point, I think more focused, smaller stores would actually work better, but it would take a large player with a real supply chain to try them to find out.) When I started in the 1970s, the big national accounts were less than 20% of a publisher’s sales and the field reps were responsible for much more than half the business. It would be inflating the importance of the field now to say that those numbers have reversed. But the changes we’ve been experiencing in the last ten years have been much more dramatic. 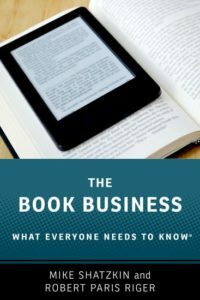 The combination of used books and the Long Tail enabled by print-on-demand, all delivered by Internet retailing, has eaten relentlessly, if invisibly, into the market for publishers’ new offerings and estabished backlist. The growth of Internet ordering has sapped the viability of the brick-and-mortar network and in the past decade we’ve seen shelf space shrink following relentless growth since the end of World War II. And, at the same time, even before the recent growth in ebook sales provoked a new digital consciousness, marketing opportunities have been shifting from the print and broadcast world to online. Publishers have adapted to these changes by changing their sales force deployments, discovering the virtues of social network marketing, and, more recently, going to XML-based origination procedures that make it easier to deliver a book’s content in a variety of ways (the principal ones being as a book, as an ebook, and as a web page.) Publishers who saw the future coming were able to prepare for it. Cambridge University Press, for example, had tens of thousands of old backlist titles set up for print-on-demand long before other publishers did and they reaped a harvest of sales and profits in the past decade as a result. Last year, Simon & Schuster shifted resources from field reps to telemarketers. In an age when Skype allows free face-to-face phone calls and gas prices do nothing but rise, one can’t help feeling they are also getting ahead of a curve by doing that. Changes of this kind make it clear that a publisher is required to have a view about where things are likely to be going to plan their business intelligently. It is our purpose to explore that: first with a long view, looking perhaps 20 to 25 years out, and then with a more immediate one thinking about changes that are literally “coming right up.” Because it’s what I know best, this view is US-centric, but because the US is the largest English-speaking market in the world and the view from where I sit (intellectually, not geographically) is that the world is now any and every publisher’s market, these thoughts should be relevant to a UK publisher even if they aren’t primarily centered on the UK market. I hope we can agree on two things before we start, though. One is that increasingly profound change is inevitable. And the other is that all future planning, just as inevitably, depends on one’s view of what that change will be. So, with that as preamble, I want to try to envision two futures: one long-term — which we will call “the next 20 years” — and one short-term, looking ahead just two or three years. Before tackling the 20 year vision, which will be disturbingly dissimilar to where we are now, I want to remind you from recent history how much can change in 20 years. Once again, I cite US-based examples, but I think these will probably be reminiscent of some aspect of local history for every market in the world. In 1968, television in the United States was dominated by three over-the-air networks that divided pretty much 100% of the national audience, approximately in thirds on average, but it was not uncommon for a single show to have half the national audience. Major cities had a few local stations available in addition; most of the country did not. By 1988, cable television penetration had reached well over half US households, delivering a choice of many dozens of channels and network TV’s share of the audience had plunged. Today there are five national TV networks in the US and they share substantially less than half the total audience. Top-rated shows fight for the attention of 15% of the country, not fifty. In 1982, record companies were on the verge of explosive growth. The Sony Walkman and other portable cassette players were joining cassette players in cars, creating an incentive for maturing boomers to re-buy music they’d purchased 10 or 20 years before on records. A very few years later, the same phenomenon repeated with CDs. Back catalog in new formats became a gold mine for established companies. But by 2002, the CD sales had turned into a curse. They were gold masters, easily ripped by any computer into the new digital formats which ultimately meant iTunes and iPod for the most part. The transition from analog to digital, which stripped the record companies of the power they had which was based on their ability to put product on store shelves, was accelerated by the CDs that all consumers had by then. The fuel for the final burst of record company profitability in the 1990s resulted in the fire that burned them up. Newspapers in the US had their biggest year yet for advertising sales in 1989. Things got even better in the early 1990s, with growth in classified ads leading the way. But then along came the Web. Classified advertising moved to Craig’s List, in some ways to eBay, and to many niche sites for camera buffs and auto aficionados and a host of online real estate communities. Google and Yahoo and the web itself disaggregated and reaggregated the content newspapers produced. Both the advertising model and the circulation that drove the advertising were challenged. Twenty years later, many newspapers have died and those that survive are hanging on by their fingernails and desperately grasping for a formula that will allow them to sustain their business online. In 1975, the mass market paperback business in the United States was the tail wagging the hardcover dog. Agents and authors were balking at the idea that the hardcover house would get 50% of the subsequent paperback income, even though it had always been that way. In 1979, Crown Publishing sold the paperback rights for the long-forgotten novel “Princess Daisy” to Bantam for $3.1 million, a number that still stands as the record for a mass market licensing deal. As my father predicted in his seminal book, In Cold Type, published in 1982, the distribution model for mass markets was inherently inefficient and couldn’t last for trade-type books. It didn’t. By 1995, mass market publishing was a genre business, which was how it started after World War II and what it is, for the most part, today. Twenty years ago, we went online through very slow modems to very limited and klunky online portals: Prodigy, Compuserve, and the seemingly-modern America Online. The World Wide Web hadn’t yet been invented! Today we carry the world’s information in the palm of our hand and we’re annoyed if we can’t get a connection, 24/7/365. And twenty years ago, the book business was on the verge of its last great boom. In the US, Wall Street was just discovering that very large free-standing bookstores, offering consumers 100,000 titles or more under one roof, were cash-generating machines. They opened the vaults for Barnes & Noble and Borders to open hundreds of such stores across the United States. In the mid-1990s, Amazon.com was founded, enabling sales even deeper into the backlist. But, although it wasn’t as dramatic as the record companies’ distribution of CDs, there were the seeds of old publishing’s destruction sown. Amazon also enabled the sales of used books and the Long Tail, books that had — before Amazon and Ingram’s Lightning Print made the idea of “out of print” an anachronism — stopped competing with the new offerings of publishers. Now they were alive again. That alone would have made things much more difficult. In addition, the impact of growing online sales steadily weaken bookstores and consequently undermine the primary USP publishers always had: that they could put books on retail shelves. These factors have made establishment publishing an increasingly difficult proposition every day of the past decade. This admitted stage-setter is the first of what will be a four-part post. The next installment will spell out a vision of the world of communication into which publishing will fit 20 years from now. The third piece will suggest what a publisher will look like then. And the fourth will cover some changes we can expect over the next three years which, among other things, might call for some recalibration of the competition between UK-based publishers and US-based ones. I’ll publish one each day that I don’t have something else until all four are up. And I’ll have added links to the subsequent pieces in this postscript as they’re made available.